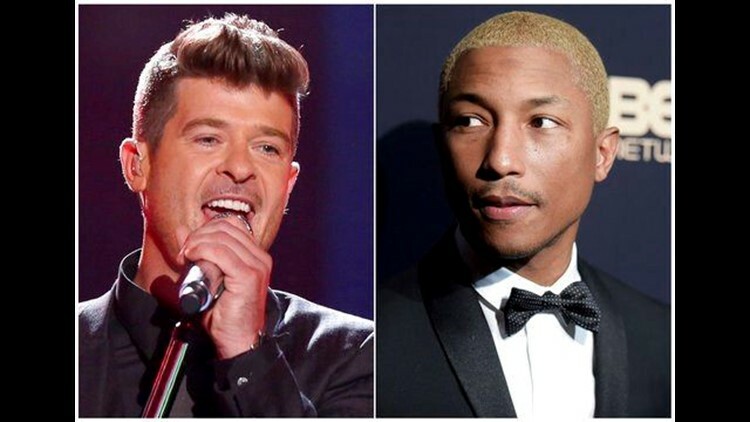 LOS ANGELES (AP) - A federal appeals court on Wednesday upheld a copyright infringement verdict against Robin Thicke and Pharrell Williams over the 2013 hit song "Blurred Lines," agreeing with lower courts that it illegally copied from Marvin Gaye's "Got to Give it Up." In a split decision from a three-judge panel, the 9th U.S. Circuit Court of Appeals ruled that the family of the late soul singer is entitled to the $5.3 million it was awarded in a case that has been closely watched in the music industry for its potential effects on copyright and creativity. Two judges rejected the defense's request to overturn a jury verdict or order a new trial, saying that Gaye's copyright on the song is entitled to broad protection. They accepted a trial court judge's instructions to jurors to decide the case based only on the sheet music to the two songs, and not the recordings. Judge Jacqueline Nguyen offered a harsh dissent, saying that the two R&B tunes resemble each other only in style not substance and that the decision was detrimental to the future of artists and creativity. "The majority allows the Gayes to accomplish what no one has before: copyright a musical style," Nguyen wrote. "'Blurred Lines' and 'Got to Give It Up' are not objectively similar. They differ in melody, harmony, and rhythm. Yet by refusing to compare the two works, the majority establishes a dangerous precedent that strikes a devastating blow to future musicians and composers everywhere." The Gaye family's attorney Richard S. Busch praised the ruling. "Despite the protests of the Williams' camp that the decision somehow stifles creativity, the opposite is true," he said in a statement. He said the verdict and Wednesday's ruling "encourages today's writers to create original work that does not take advantage of the success of others while pawning it off as their own." The court also upheld a jury's verdict that hip-hop artist T.I., who raps in the middle of the song, and Interscope Records, are not liable for damages in the case. While artists normally fall firmly on the side of greater copyright protections, many lined up behind Thicke and Williams in this appeal. R. Kelley, composer Hans Zimmer and members of The Go-Go's and The Black Crowes were among more than 200 musicians who jointly filed a brief in favor of the defendants, saying the ruling could have an "adverse impact on their own creativity, on the creativity of future artists, and on the music industry in general." The trial over "Blurred Lines," the biggest hit of 2013, ended in March 2015 with jurors awarding Gaye's family more than $7 million. The verdict was later trimmed to $5.3 million. The Gaye family also received 50 percent interest in ongoing royalties from the song.